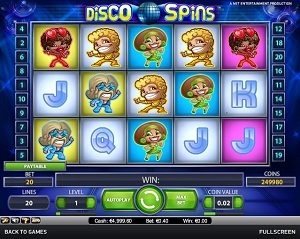 Disco Spins is a hip and cool online video slot machine game from Net Entertainment that has been released on December 2012. This video slot game has 5 reels and 20 pay lines. The theme of Disco Spins is inspired by disco dancing (and the music of Saturday Night Fever) in the ‘70s. When you play Disco Spins, you may have the urge to grab your flare outfit and strap onto your platforms, as this online video slot game can make you dance “mentally” while playing this game! Disco Spins features 5 different disco dancers that appear anywhere on the 5 reels, as well as the regular letter and number symbols. The reels are unique and are designed to complement the theme of this game as it has been made to look like a dance floor. What many online slots players liked about these 5 dancers is that all of them can become Wild Symbols! One of the best things that many slots players love about Net Entertainment online slot games is that they can instantly play the game for free, without the requirement to download anything! If you dig the groovy music of the ‘70s disco, or you like to simply party and dance till you drop, then Disco Spins will surely make your online slots gaming much more fun and entertaining! With the chance to win up to 230,000 coins in a spin, two different Free Spin Bonus feature games, a Dancefloor Wild Feature which is what made this game so favorited by many online slots players, and a high 96.4 payout ratio, Disco Spins is truly a video online slot game that is worth playing at! As always, Net Entertainment does not disappoint when it comes to quality graphics and entertaining sounds in any of their online video slot games. Disco Spins is literally the online slot game for those who love to party and dance! In this game, you won’t become bored because it is packed with animations on every spin and the colors are very vibrant, but it will not strain your eyes. The symbols are drawn in a cartoon-like manner, with small bodies and freakishly big heads. The overall graphic design of Disco Spins showcases a range of different colors such as pink, white, blue, green, red and yellow. As for the sound, Disco Spins has obviously a constant background music of what you usually hear in discos and dance parties (think groovy and funky). When you spin the reels, you will hear much louder disco sound effects whenever you hit a winning combination! In the Disco Spins slot game, the regular card deck symbols available are J, Q, K, and Ace. The other symbols that you will see here complement the Disco Spins theme as you will find different dancers such as Rita (red), David (yellow), Nikki (purple), Donna (green), and Barry (blue). The Wild Symbol comprises of Disco Dancers and the mechanics is quite unique in Disco Spins video slot machine game. The thing is, there is no permanent Wild Symbol in this game; but rather the disco dancer symbols turn into Wild Symbols via the Disco Spins Dance Floor Wild Feature. In the Disco Spins slot game, whenever you spin the reels, there are 15 Dance Floor Tiles that appear on the reels with a random color pattern. If the color of the Dance Floor Tile matches the clothes color of the Disco Dancer that appears on top of it, then that Disco Dancer symbol will automatically become a Wild Symbol. This simply means that the Disco Dancer Wild symbol acts as a substitute for regular symbols in order for you to complete winning combinations. As many as 8 Disco Dancer Wild Symbols can appear on the Disco Spins video slot machine reels simultaneously, which truly offers an amazing chance to get big wins! The Scatter Symbol is the Disco Mirror Ball. This simply means that the Disco Mirror Ball Scatter symbol does not need to come out in a line on an enabled pay line for you to win. The Disco Mirror Ball Scatter symbol only appears on the 3rd, 4th, and 5th reels. If you hit 3 or more Disco Mirror Ball Scatter symbols, you can choose to play either the Regular Free Spin Bonus Feature game, or the Disco Spins Free Spin Bonus Feature game. Hint: The Disco Mirror Ball Scatter symbol does not give you any winnings, but they let you enter and play one of the two Free Spin Bonus Feature games. There are 2 awesome Bonus Feature games that are available in Disco Spins online slots. The nice thing about this is there is only 1 Scatter Symbol for both of these Bonus Feature games to be activated, but you can choose only one of them. Both of the Bonus Feature games award you with Free Spins + multipliers. Regular Free Spin Bonus Feature Game – If you hit 3 or more Disco Mirror Ball Scatter symbols that appear anywhere on reels 3, 4 and 5; and if you choose to play the Regular Free Spin Bonus Feature game, you will win 15 Free Spins, wherein all your winning combinations during the Free Spin Bonus games are tripled or multiplied x3! If you manage to hit another 2 Disco Mirror Ball Scatter symbols (that are scattered anywhere on reels 3, 4 and 5), you will trigger yet another 3 additional Free Spins. The extra Free Spins are added to your remaining number of Free Spins. If you manage to hit another 3 Disco Mirror Ball Scatter symbols (on reels 3, 4 and 5), you get another 15 Free Spins! During the Free Spin Bonus Feature game, you can win an infinite number of additional Free Spins. When the regular Free Spin Bonus Feature game is complete, you are then taken back to the main Disco Spins video slot game and your Free Spin game wins are then added to your total win. Disco Spins Free Spin Bonus Feature Game – If you hit 3 or more Disco Mirror Ball Scatter symbols that appear anywhere on the 3rd, 4th and 5th reels; and if you choose to play the Disco Spins Free Spin Bonus Feature game, you will win 10 Free Spins. In this bonus game, only the Disco Dancer symbols and the Disco Mirror Ball Scatter symbols can appear on the reels. If you manage to hit 2 Disco Mirror Ball Scatter symbols (scattered on reels 3, 4 or 5), you are awarded an additional 3 Free Spins! If you hit 3 Disco Mirror Ball Scatter Symbols (scattered on reels 3, 4 or 5), you are awarded an additional 10 Free Spins! The extra Free Spins are then added to your remaining number of Free Spins. During the Disco Spins Free Bonus Feature game, you can be awarded an infinite number of additional Free Spins. When the Disco Spins Free Spin Bonus game is over, you are then returned to the main Disco Spins video slot game and your Free Spin game wins are added to your total win. Disco Spins has 5 reels where you may bet on 20 pay lines. The minimum bet is 0.01 coins and the maximum bet is 1.00 coins per line. Playing online video slot machine games is more fun and easy when there is an Autoplay function available. You can find the Autoplay function in Disco Spins via two locations: the usual spot is on the lower left most corner of the screen, and the second one is just on beside the Spin button (left button). With its Autoplay function, Disco Spins can be automatically played as complex or as simple as you want it to be. In its simple settings, you can quickly choose from 10, 25, 50, 75 up to 1000 auto spins which play with the use of your preset bet. If you would like to try it out, tweak the Advanced Settings wherein you can start Autoplay and “Stop” each time: you win, if you won Free Spins, if your single win exceeds the amount you specify, if your cash increases or decreases by the amount you specify. After fine tuning the Advanced Settings, simply click the Start button and the game will automatically play for you.